The University of Arizona baseball team’s 2010 schedule is up on the school’s official web site. The Wildcats’ spring slate includes 27 home games at Jerry Kindall Field at Frank Sancet Stadium. Beach State, Cal State Fullerton, Northern Colorado, and Sacramento State. The Wildcats will also play non-conference two game sets vs. UNLV, Saint Joseph’s, Wichita State and New Mexico. The Wildcats begin Pac-10 play vs. Oregon with a 3-game home series that starts on March 26. They play their first road games at California April 1,2 & 3 in Berkley, CA. Other Pac-10 road series are vs. Washington, USC and Oregon State. The Wildcats host Washington State, UCLA, Arizona State, and Stanford. Two “non-conference” games vs. Arizona State will be played in Tempe on Aprl 20 & May 4. Cal State Bakersfield also visits Tucson May 7-9 in Arizona’s last non-conference action. 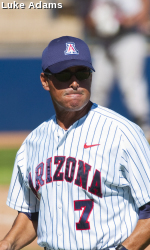 In all Arizona plays eight games against 2009 College World Series teams.